ALBI Nissan is the first Japanese brand in Mont-Tremblant, a resort community about 140 kilometres northwest of Montreal. ALBI Nissan opened its doors in Mont-Tremblant, Que., last Friday, the 200th Nissan dealership in Canada since the company began importing cars here under the Datsun marque in 1960. Ken Hearn, the Japanese automaker’s director of dealer network development, would not discuss Nissan’s Canadian dealership strategy for competitive reasons, but said aggressive expansion is not its approach. New stores are opened based on a careful assessment of regional needs looking at potential demand and locations that make sense to operators. He pointed out ALBI Nissan is the first Japanese brand in Mont-Tremblant, a resort community about 140 kilometres northwest of Montreal. Hearn noted Nissan has about 15 fewer dealers than Hyundai, which has comparable sales numbers but there are some months Nissan sells more vehicles. 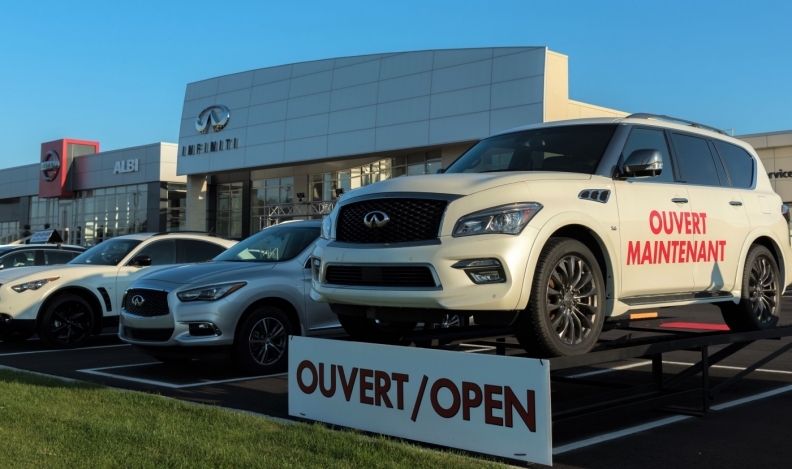 ALBI le Géant, a large Quebec-based dealer group that includes FCA, Honda, Kia and Mazda stores, now has seven Nissan and two luxury Infiniti outlets. Quebec has been a strong growth area for Nissan along with Atlantic Canada, where a number of new dealers will be opening, said Hearn. “If you look at dealer count in terms of Atlantic Canada, we do not have anywhere near the number of stores as Honda and Toyota do,” he said. The new ALBI Nissan store is the latest version of Nissan’s Retail Environment Design Initiative, which, so far, has upgraded 14 Canadian dealerships to the automaker’s fresh design template featuring a stronger exterior presence, more open and inviting interior and greater use of digital tools. Nissan sold about 122,000 vehicles in Canada last year, up almost three per cent from 2015. Sales figures through August of this year totalled 92,573, ahead of last year’s 84,984, despite a drop in passenger car sales.